BANGI, 23 Jan 2014 – KPJ Healthcare Berhad’s (KPJ) status as the leading provider of private healthcare has been attributed to its commitment to capacity building. 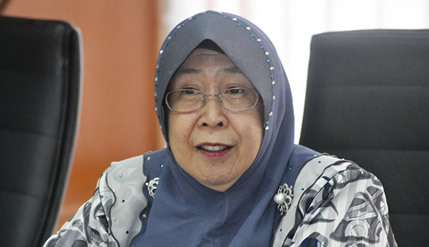 Advisor and Director of the company, Datin Paduka Siti Sa’adiah Sheikh Bakir said KPJ Healthcare believes that its staff are the company’s most important assets. As such the company takes good care of all its staff through various capacity building efforts, she said at a Public lecture organised by UKM’s Tun Fatimah Hashim Women’s Leadership Centre here today. Thus KPJ continues to have loyal and dedicated staff where for example its medical specialists rarely resigned. Instead other hospitals are losing their good specialists to KPJ. This is because they know that they will be rewarded for their hard work. “You can come in to KPJ Hospital as a staff nurse and end up as the CEO of a KPJ business unit,” she said. Another way of enriching others is by taking over other private hospitals. The private hospitals run by doctors made more money when they come under the wings of KPJ. The doctors can concentrate on what they do best which is helping people to get better. By coming under the KPJ brand they do not have to worry about their bottom line and management issues. So, many have come on board since KPJ opens its first hospital in 1981. Today it has over twenty three medical centres, 7 hospitals in various stages of developments and two age care centres, Datin Paduka Siti Sa’adiah said. KPJ is also clear about its focus knowing what it wants to do. “We just focus on healthcare and even invest money to become stake holders in some companies to learn about the uniqueness that they have,” she said. KPJ invested in a nursing village for the elderly in Australia so that it can learn about running a nursing home and start implementing it in Malaysia. It has also acquired a 23.37% stake in Vejthani PCL which operates the Vejthani Hospital in Bangkok, Thailand. One of the main reason is to learn about customer service something that the Thais are known for. She admitted that it also had its fair share of failures but when that happened it moved on saying that there was no use in crying over spilt milk. Her advice to those starting a business is to run faster than others in the race. “Once you are already in the race, you need to create a different race. Then only can you become a leader in whatever you do”. She did caution that no business model will work forever, so there is the need to constantly rejuvenate the business with innovations. Present at the talk was the Director of the Tun Fatimah Hashim Women’s Leadership Centre, Assoc Prof Dr Madeline Berma, students, lecturers and members of the public.